The Ram Stadium hosts exciting games and events year-round, and guests at our Mineral Wells hotel are just a few moments away. Whether youre here to visit the Clark Gardens or the Vietnam War Memorial, southern hospitality and an unbeatable location are important. At this Mineral Wells hotel, guests have it all, from spacious, comfortable rooms to the best service in town. The Holiday Hills Country Club is a short drive away, which is a must for golfers and those looking for a decadent dinner. Our Mineral Wells hotel is within walking distance to Brazos River Factory Stores, where shopping is nearly a sport. Our pet-friendly hotel welcomes the entire family, because we know that can make or break a vacation. There are plenty of great dining options in town, but leave breakfast to us. A free, full hot breakfast features sizzling waffles, fresh fruits and pastries, a great cereal and yogurt selection, and 100% Arabica coffee or cold juice. The Rails for Trails is a popular destination for many of our Mineral Wells hotel guests. Mineral Wells State Park is another option for outdoor lovers, with trails and picnic spots in abundance. From Fossil Park to the luscious gardens, the beauty of Texas is highlighted here. Enjoy plenty of truck/RV parking and oversized guest rooms that are truly Texas-sized. A 42-inch flat screen TV with HBO is waiting in your room, and each guest gets access to the Holiday Hills Country Club. Golfing, fishing, biking, and swimming in Mineral Wells are yours for the taking. Even business travelers make time to enjoy the recreation options here. Employees of Hydroscience, Cantex, NOV Technologies, and Peco Facet depend on our Mineral Wells hotel to provide the best value, location and service available. Were proud to host travelers from around the world, and we go the extra mile to make your stay comfortable. Reserve a spacious guest room at Best Western Club House Inn & Suites right now! Enjoy your stay. From: All directions. 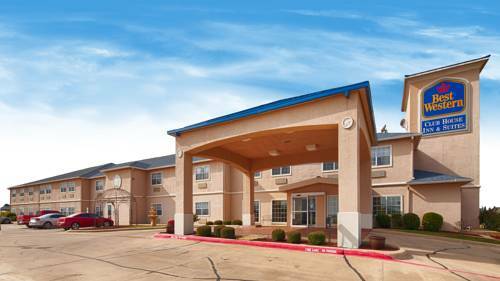 The Best Western Club House Inn & Suites is located at the southwest corner of Highway 180 and FM 1195, just across from the golf course. 3.00 mile(s) from Woody's Tavern, pub, American, open 11:00 a.m. to 10:00 p.m.
1.00 mile(s) from Shotgun's Bar-Que, open 11:00 a.m. to 10:00 p.m.
1.00 mile(s) from Pulido's, Mexican, open 11:00 a.m. to 10:00 p.m.
3.00 mile(s) from Baris Italian Ristorante, Italian, open 11:00 a.m. to 10:00 p.m.
2.00 mile(s) from Blackhorse Caf , cafe, American, open 11:00 a.m. to 10:00 p.m.
~34 miles from Mineral Wells. Big dino statues from the 1964 NY World's Fair stand near a riverbed full of authentic dinosaur footprints. ~41 miles from Mineral Wells. ~58 miles from Mineral Wells.